Murray’s riding gear and street clothes mirrored mine fairly well. He also had a second set of street clothes but did not utilize the clothing like I did and says he would definitely leave the extra pants, socks and one of the shirts at home. He carried his Asus laptop and commented that he wished he had taken his iPad instead as the laptop made his pannier very heavy. He had the bike tools, pump and chain lube, so his weight was about 30 to 35 lbs total. 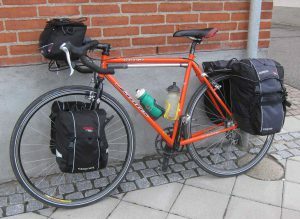 He had an extra pannier on his handlebars which carried his heavy SLR camera, the 360 degree camera, wallet, Tums, passport, notepad and reading glasses. The map and iPhone were in a plastic sheath on top of the bag.